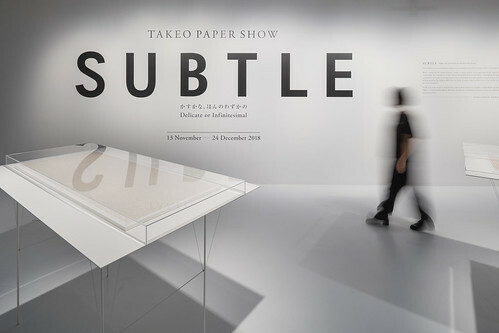 Originally held in Japan in 2014 as part of the exhibition series presented by paper company Takeo, the show has now arrived at London’s newly opened Japan House after stints in Milan, São Paulo and Los Angeles. Kenya Hara asked artists, animators, graphic designers and architects to create works based on the theme of ‘Subtle’ using Takeo fine papers. 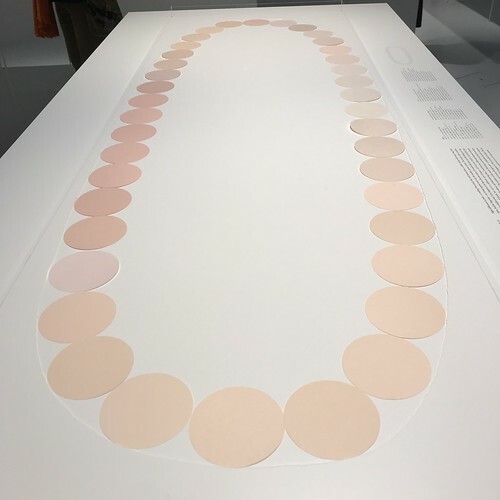 The result is an inspiring collection of breathtaking, minimalist delicacy that acts as a ‘palate cleanser’ in this busy world of information overload. However, ‘breath-holding’ might be a more appropriate description for the exhibition. On arrival visitors are asked not to touch or lean on the displays. The white display boxes are perched on dangerously thin legs, like a crane fly on a leaf. Inside the boxes are tiny flowers, threads, folds and cut-outs, all made of paper. They are so delicate that I found myself hardly breathing for fear of blowing each beautiful structure away. Right and top. 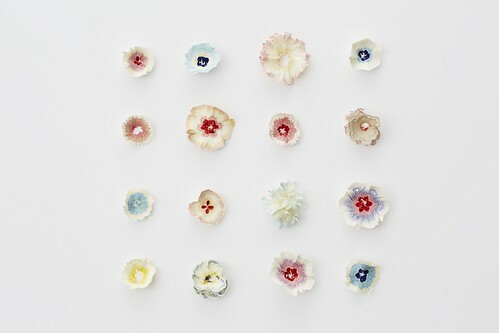 Haruka Misawa, Paper Flowers. 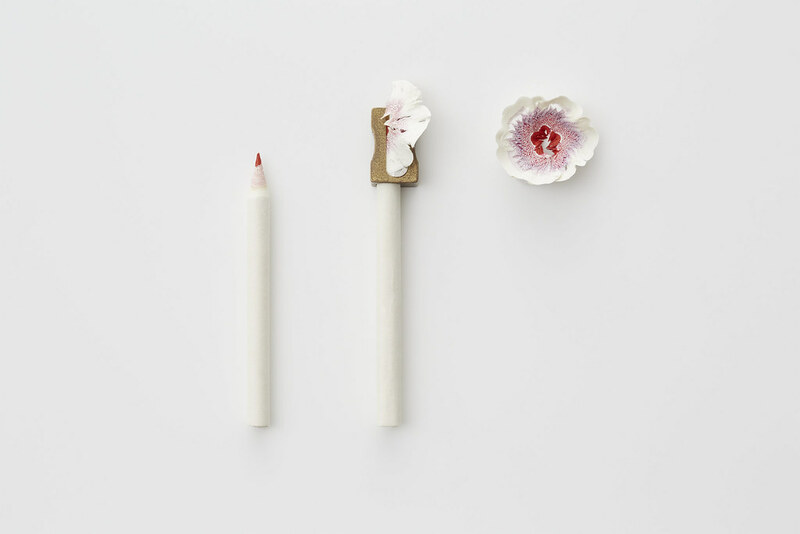 Haruka Misawa’s Paper Flowers resemble pencil shavings. 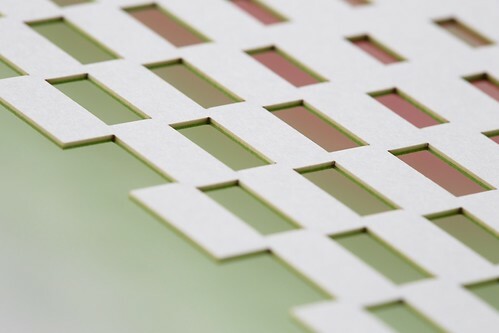 The works are created by winding layers and layers of coloured paper around a core and then sharpening it like a pencil. Yoshiaki Irobe, I Hate U I Love U.
I hate you / I love you by graphic designer Yoshiaki Irobe cleverly uses the ambiguity of the message in a negative-positive treatment, using the reflections of lattice-cut neon paper floating face down above a white board. Kenya Hara, mouldings for ‘Ispahan’, a macaron cake made by Pierre Hermé Paris. 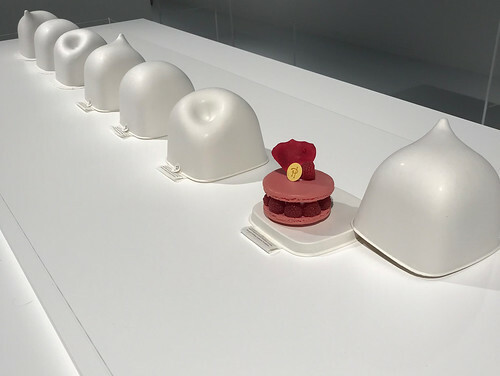 ‘Subtle’ curator Kenya Hara, perhaps best known as creative director of Muji, shows his own work with precision mouldings for the macaron cake called Ispahan by French patisserie Pierre Hermé Paris. Made from pulp, they have their own special character and all stack together neatly. Exhibition photo by Steve Davey. Yumiyo Miyata, Something Like a Necklace Connected Sharing a Light Contact. Something Like a Necklace Connected Sharing a Light Contact by Yumiyo Miyata is a paper ‘necklace’ made with paper discs from the Takeo Mihoncho Honten store. Theses are all slightly different in shade, texture, finish or weight, resulting in a pleasing panorama of subtle variations. 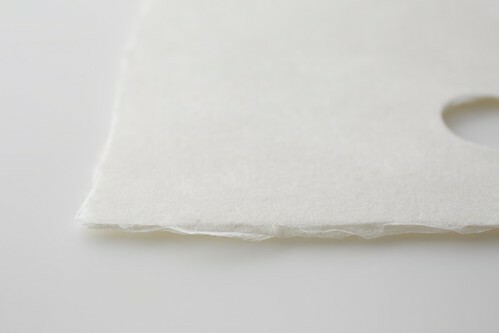 Japanese hand-made papers, or washi, have soft, fluffy edges (called ‘ears’) where the pulp has been spread on to a screen. 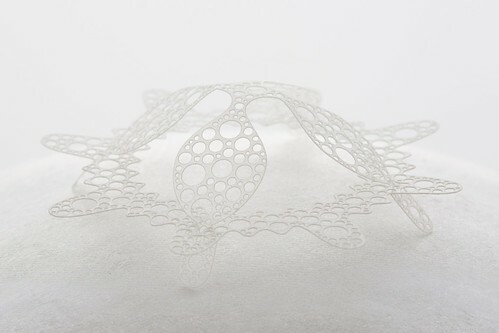 Chocolate’s Hats by Kenya Hara explores laser cutting technology with translucent paper. 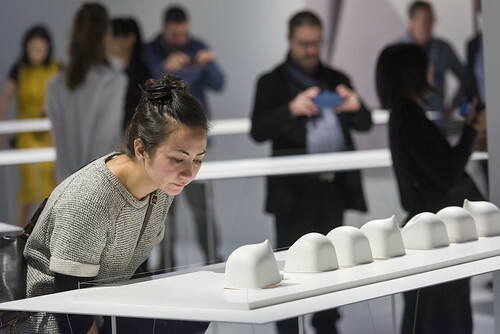 Exhibition photo by Jeremie Souteyrat.